Mobile trucks are rolling on to Arizona State University, James Madison University and Coastal Carolina University this fall. 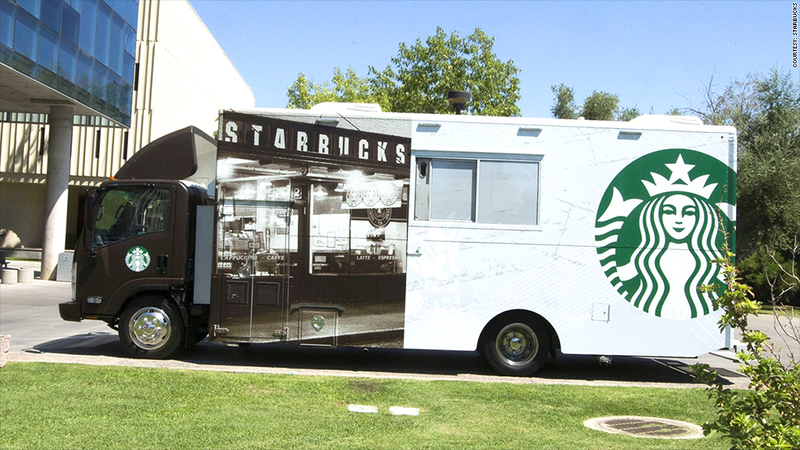 Here's something that will make returning to school less painful for some college students: Starbucks is launching food trucks. The lucky students at Arizona State University, James Madison University in Virginia and Coastal Carolina University in South Carolina won't have to hit up the school cafeteria for a cup of coffee or snack any longer. The mobile Starbucks truck could be parked right along their route to that 8 a.m. class. The trucks will offer a menu of food and drinks nearly identical to that found in Starbucks (SBUX) stores and will move to various locations on the campuses, the company said in a news release. The three selected universities already have Starbucks locations on campus, but the trucks are expected to have more flexible hours and in some cases will stay open later than a dining hall. The four-wheel service is only a pilot program for now. Trucks are already rolling at Arizona State and James Madison. One will hit the road at Coastal Carolina on Sept. 2.